Plans for ImaginOn: The Joe & Joan Martin Center, began in 1997 when two colleagues had an idea. Bob and Bruce collaborated on how they might work together to meet the expanding needs of both organizations. Together, they imagined a new and innovative space, a shared facility. But not just a combination library/theatre - they imagined a new type of facility, and an original approach to education, learning and the arts. 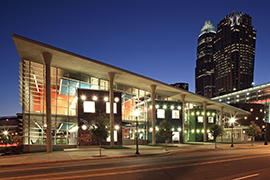 The more they thought about the possibilities, the more they realized Charlotte Mecklenburg Library & Children's Theatre of Charlotte shared much more than a need for more space - they also shared a powerful mission: bringing stories to life. What came next was a unique partnership that features two state-of-the-art theatre spaces, a dedicated library space for youth 11 and under, four multi-use classrooms, a teen-only library, a multimedia production studio and an interactive exhibit space. Together, under one roof, the Library's Executive Leadership, including Charles Brown, Vic Phillips, and now CEO Lee Keesler have worked together with Bruce and dozens of library and theatre staff members to ensure ImaginOn's success. At ImaginOn, young people learn in many ways, through all five senses and "from the page to the stage." It is the launching pad for remarkable journeys and endless possibilities. Children’s Theatre of Charlotte is dedicated to creating vibrant and engaging professional theatre experiences on the stage, in the classroom and throughout the community. As a national leader among theatres for young audiences, it serves over 250,000 people each season. The Theatre is committed to developing the potential in all young people, dedicated to achieving the highest artistic standards and serving audiences that are broadly diverse. CTC is proud to be a former recipient of the prestigious Harold Oaks Award that recognizes individuals and organizations for exemplary contributions to theatre for young audiences. With the 2018-19 season, CTC launches a unique endeavor, The Kindness Project. We’ve commissioned three world-premiere plays– two this season, Last Stop on Market Street and A Sick Day for Amos McGee, and The Invisible Boy in our 2019-2020 season– that feature kindness as the central theme. We’ve invested in this project because we recognize the power simple acts of kindness hold. And we did this for one simple reason: to spread kindness wherever we can and to encourage children to act kindly toward others. Charlotte Mecklenburg Library began more than a century ago as a treasured repository of knowledge. Although humankind has evolved to read, explore and acquire knowledge in many new ways since then, one important feature has endured: Our services remain free to all who come to us with a desire to research, learn and experience. Today, libraries must remain nimble and responsive to the changing needs of our customers. Through the evolution of communication technology, there has never been more information available to more people in human history. We act as a guide through that universe of information, providing access for those who don't have it, and collaboration for those who do. We also provide the building blocks for understanding that information, through the development of literacy, skills for success, and community connections.